1L WHISKEY DECANTER. Here you?ll find the latest and greatest products. In other words ?. When you order from us, you?ll always get a great product at a great price. 6 X DRINKING GLASSES. Want to get in touch?. Great way of storing your favourite spirit. Perfect for occasions or as a gift. Part of the Estilo collection featuring perfect crystal clarity. The Estillo range also includes: red wine glasses, white wine glasses, champagne flutes and pitcher jug. Here is a really nice boxed set consisting of a Decanter and 2 whisky glasses. From Celtic Crystal. Featuring a Welsh Dragon and the Lettering Cymru Wales on both the decanter and glasses. In original boxed presented in black satin. Glass Tumblers. There is a crack to the base of 1No. Tumbler as shown within the photographs, however as the tumblers are made of thick glass, it appears to still hold liquid within it. 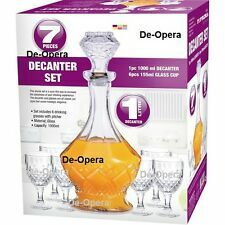 The decanter can hold upto 1L of wine. The large, square decanter features the Stark, Lannister, Targaryen and Baratheon house sigils in a decorative borders, one on each side. Each of the four tumblers features the house sigil of either Stark, Lannister, Targaryen or Baratheon on the front and back. Glass Whisky Decantor in box. Whisky Decanterand will make. Pyramid CrystalWhisky Decanter. The Decanter is sturdy and weighty with a presence. Premier Pewter Specialists. pewter holder which are secured together The matching handmade pewter and crystal. A lovely personalised decanter set and glasses. This stylish whisky 0.5 ltr decanter looks stunning when engraved. The decanter features a clear glass design with a glass stopper. Perfect gift for whiskey enthusiasts. 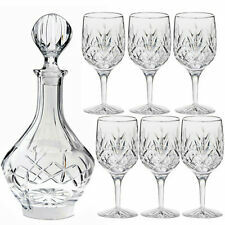 Set Includes 6 drinking glasses & Decanter. 1Pc Decanter : 1000ML. 6Pcs Glass Cup : 350ML. Capacity: 900ml. 4 x 80ml Glasses. 1 x Glass Decanter. Decanter Size: 23cm H x 9.5cm W x 9.5cm D.
1Pc Decanter : 1000ML. Set Includes 4 drinking glasses with pitcher. St Germain Elderflower Liqueur Cocktail Carafe Pitcher Decanter Tall Glass. From a recent house clearance and age unknown but are vintage. Decanter and 6 glasses. Stopper is glass but seal part is plastic which keeps it fresh? Could do with a clean as taken out and photographed and put back away. "light and music" series. great condition. The decanter is 27.5cm/10.3/4" high and 9cm/3.1/2" square. On the lower quadrant of the decanter face is acid etched "Haig & Haig Whisky". A LARGE RED GLASS WHISKY DECANTER. 10" TALL INC TOP AND 13" CIRCUMFERENCE. BLACK GLASS SCREW TOP. 1Pc Decanter : 1000ML. Set Includes 6 drinking glasses With Pitcher. Classic port decanter in blown glass with stopper to keep the port fresh. Fill the glasses with port and sip through the pipe to enhance the pleasure of the tipple;. Holds a whole 75cl bottle. Sip through the pipe to enhance the pleasure of the tipple. The front of each item is engraved with Carnoustie Golf Links text & emblem. Each item also has the Burns Crystal Made In Scotland sticker on ( Unused). 1Pc Decanter : 1000ML (D14 x H 30.6 cm). Set Includes 6 drinking glasses With Pitcher. 6Pcs Glass Cup : 155ML (D 7.5 x H 8.6 cm). 1Pc Decanter : 1000ML. Set Includes 6 drinking glasses With Pitcher. 6Pcs Glass Cup : 155ML. Vintage Glass Crystal Decanter With Stopper ~ Whiskey/Brandy/Rum/Wine etc. 30cm tall with their charming leather collars embossed 'whiskey' and 'cognac'. These look 100 years old but they aren't as the stoppers have a plastic collar. What this means though is that they are air tight and don't leak. Nobody would know with them on though...... they look like something found in the cabin of a galleon! Striking and unique in emerald green. Please see my other items. Tumblers: 6 x 200ML. Decanter Size: 23 x 9.5 x 9.5CM. The six glasses allow you and your guests to enjoy a refreshing drink. Keep your drinks looking nice too! Square Design. 4 x 200ml Tumblers Decanter Capacity: 900ml Square Design Airtight Lid Stopper Enjoy a refreshing drink in style with this set of 4 x 200ml whiskey tumbler glasses and Decanter Set. The whiskey glasses are thick based and wide mouthed allowing the tumblers to contain more beverage. The traditional style Decanters with a square modern twist will store and protect your beverage in its tough glass innards. The Decanters are suitable for all alcohol types from whiskey to wine, so are appropriate for all drinkers no matter what your poison is. On the square lid there is a plastic stopper to prevent spillages and to preserve your liquid. This set will make a perfect Christmas gift! The whiskey glasses are thick based and wide mouthed allowing the tumblers to contain more beverage. Whiskey Tumblers Set only. 4 x 200ml - 255ml Tumblers. The Decanters are suitable for all alcohol types from whiskey to wine, so are appropriate for all drinkers no matter what your poison is. Perfect condition, No marks or scratches on either item. Rogaska Crystal. 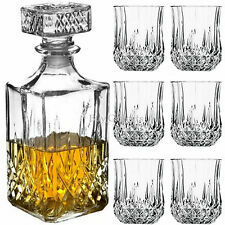 Enjoy a refreshing drink in style with this set of 4 x 200ml whiskey tumbler glasses and Decanter Set. 4 x 200ml Tumblers. The whiskey glasses are thick based and wide mouthed allowing the tumblers to contain more beverage. 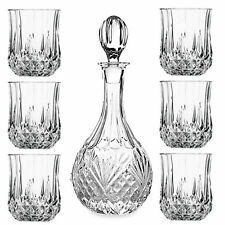 Regal Crystal Square Spirit Decanter Whisky Set. Decanter and 2 Tumblers.